I was truly inspired by a book written and illustrated by Jacqueline Bouvier (aka Jackie Kennedy aka Jackie O) and her sister Lee. It's called One Special Summer and it's a wonderful recounting of a trip they took in 1951 when they were but 22 and 18 respectively. This is a great gift idea in two ways. First, the book itself is a treasure. I found a copy in the local library but if anyone I know is reading this, I desperately want one of my own. Hint hint!!!!! Also, you can try this idea for yourself. Make your own illustrated journal of a special trip or for an anniversary or birthday. If you can't draw as well as Jackie, don't worry. A friend of mine made a similar keepsake when we were in high school. She used lined notebook paper and drew stick figures. She kept drawing throughout our church ski trip and later made copies for everyone. It was hysterical and better than any photo journal because her hilarious comments and silly cartoons helped us remember all the inside jokes and craziness. 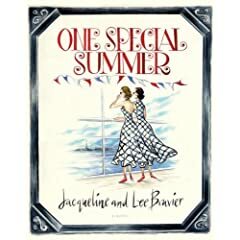 One Special Summer is a great way to look into the early mind of a woman who knew classy and fabulous as few have.